Learn What is Stopping You From Having a Flat Belly & a Six Pack. It’s time to lose that stubborn belly fat and put an end to feeling bloated. ​The Flat Belly Challenge is a holistic based approach to getting a flat belly for life!! ✓ ​learn about flat belly foods - what are they? how they work? ​This is not a low calorie quick weight loss program, or cardio based program to get thin quick… only to leave you to bounce back as soon as you finish! 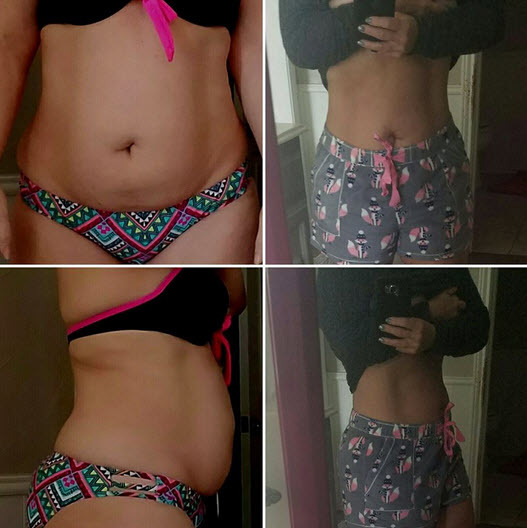 Amazing Results in Just 10 Days!!! “I had fallen off the wagon, added a ton of weight then went to Central America for 10 days in February. After the trip, I was horrified by my vacation photos! Realizing that I needed to strap down, I started following Lyzabeth’s nutritional recommendations. I have just restarted Month 1 but these are my differences so far in just 10 days. I've proudly stuck to the food guidelines and am religious about the fire shots! I can NOT tell you how happy I am not to feel bloated all the time. My tummy always felt round, hard from pressure and it was awful physically and mentally, to be honest. It is utterly amazing to me what just clean eating can do for your body and mind. It wasn't my plan to join here in quest of a perfect bikini body or abs, I’ve just wanted to be happier with myself and to be healthier so THANK YOU all for the help and support moving forward"
I’ve trained hundreds of thousands of women world-wide though my programs including my TrainWithLyzabeth.com on-line training program. Now, while I’ve dedicated my life to fitness & education from the age of 14 when I got my very first fitness certification, there was a point in my life when my once flat belly ballooned out, out of nowhere. There were points that it looked like I had a basketball under my shirt, I just couldn’t understand it, at all! It was beyond frustrating! I went to see doctors and they said I was the picture of health, but I knew something was wrong. It was at this point through research and frustration that I discovered holistic nutrition. I looked into it further and decided to enroll and went to study full time for two years. Holistic nutrition in a nutshell is the power of whole foods and understanding how your body reacts to food. From this program, I cured this belly bloat, and other issues! Did you know food can causes other issues including headaches, acne, and low energy? After I fixed my food issues I felt amazing, happy, have a six pack year round and most of all I have a better understanding of how my system works which allows me to look into what’s going on if I should ever get bloated, have trouble sleeping, or experience fatigue again! I have an idea of what’s causing it and how to fix it.... and so can you! I've paired this with information and ab movements I have learned during many years of training in Mat Pilates to help you cinch your waist and create the Hourglass figure (level 4 Advanced Pilates Certification). The Flat Belly Project isn’t a workout video or a diet, it’s an educational tool for you to understand what is stopping you from having a flat belly or a six pack. It’s 10 chaptered audio recordings by me that will educate you on what is going on inside you that is stopping you from reaching your goal and will explain how to fix it to finally reach your goal for good! Please note, as a registered holistic nutritionist, this is not an ordinary diet, this is a diet that is meant to reduce inflammation, increase your energy, stop your bloating, gas, acne, fatigue, fight disease… and give you a flat belly just like it’s done for me and thousands of my clients. I know this may sound cliché but, this is really a system that can give you a flat belly forever!!!! **Please note that all online programs including the Flat Belly Challenge are non-refundable items and are not eligible for returns. Price is listed in USD.